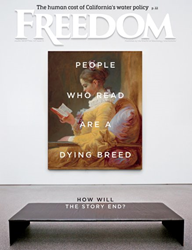 Freedom Magazine’s March edition looks at the lost art of reading for pleasure. One in four Americans didn’t read a single book last year. And more than half of U.S. teens don’t read for pleasure, ever. Meanwhile, research shows that readers are better able to communicate and better equipped to deal with feelings—both their own and other people’s. Exposure to literature also breeds empathy, spurs compassion, and fuels success, according to Freedom’s March cover story. High & Dry: California’s San Joaquin Valley produces 25 percent of America’s food on just one percent of the nation’s farmland. The region is in its fourth straight year of drought, and facing a second year of zero water allocation. But while the crops are withered and the land is fallow, the people who farm California’s Central Valley are not. They fight to survive, and for a very basic human right: access to water. Search & Rescue: When a gas explosion reduced a Mexico City maternity hospital to rubble, the Scientology volunteer ministry rushed to help. So did one very brave 11-year-old boy. Bitter Pill: Does Big Pharma buy trials? The slippery ethics of for-profit clinical testing in Africa, India and much closer to home. Freedom Magazine is committed to accurate and accountable reporting. Freedom is the voice of the Church of Scientology and reflects its stance that responsible journalism and the free flow of information are the lifeblood of all great societies. Published since 1968, Freedom addresses issues, not politics. It seeks out and illuminates solutions to society’s problems. Freedom proudly serves as a media watchdog, protecting the exchange of free ideas on which democracy relies. Freedom further spotlights the Church of Scientology-sponsored human rights, social betterment, and volunteer works, thereby advancing its purpose of safeguarding and promoting the rights of all.